Soak in sun, fun and culture all located in Ayia Napa and all easily accessible from great value for money accommodation at the Tsokkos Holiday Apartments. With great essential facilities both around the hotel and in the apartments themselves, guests will have all they need for a great fun and relaxing stay in Ayia Napa. The complex of Tsokkos Holiday Apartments provides guests with three outdoor swimming pools as well as a children’s pool, a themed buffet restaurant serving local and international dishes and great daily entertainment that includes live shows, music and theme nights to name just a few of the great on-site entertainment available. The nearest beach is an easy stroll, taking less than five minutes to reach and there are many restaurants and bars are also equally accessible. Whilst it’s fairly quiet during the day Ayia Napa comes to life at night with its world famous clubbing scene serving up a plethora of clubs to keep the party going all night long. Being located in the most popular destination in Cyprus, Tsokkos Holiday Apartments are approximately 55km from Larnaca International Airport. Their central Ayia Napa location puts it within easy reach of all of the conveniences you’ll need during your stay in Cyprus. The nearest beach is less than a five-minute walk from the apartments. Several water parks are also only a few minutes away located closer to the coast. Those coming for the nightclubbing scene will find numerous clubbing spots within less than a mile radius from Tsokkos Holiday Apartments. 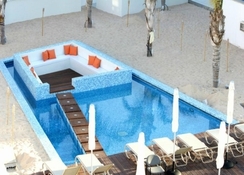 Restaurants and bars are just as abundant as are tourist attractions such as the National History Museum of Ayia Napa. The rooms at Tsokkos Holiday Apartments clean, comfortable as well as being well-furnished and decorated. They are also well equipped with essential amenities such as air-conditioning, T.V., private bathroom, safe deposit box, tea and coffee making facilities and more. Additionally, as these are apartments, feature kitchenettes equipped with cooker, microwave, kitchenware and more besides, enabling you to relax and dine in at your room. The apartment rooms typically sleep up to four guests and offer views that range from land views, which overlook either gardens or street or a pool view. Guests at Tsokkos Holiday Apartments will find a themed buffet restaurant which serves traditional Mediterranean dishes as well as international favourites. 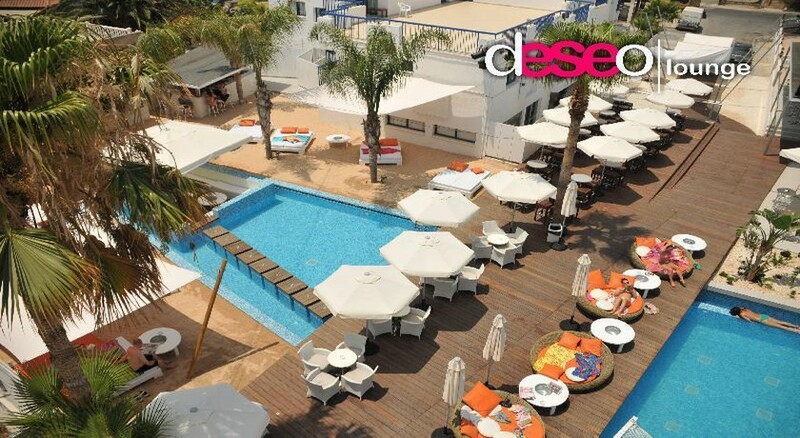 There is also a poolside bar, so you can chill out with a delicious drink by the pool and under the Cypriot sun. Being located in central Ayia Napa gives guests great access to exceptional dining experiences, including some which include great views over the Mediterranean at the same time. If you like seafood, then sample a Mediterranean take on seafood at Ocean Basket. Hokkaido Restaurant serves classic Japanese cuisine, Quadro is the place to go for Italian fare and you’ll easily come across various great tavernas serving up traditional Cypriot and Greek food. Tsokkos Holiday Apartments provides a variety of great ways to enjoy your holiday. There are three outdoor pools to choose from as well as a children’s paddling pool. There are also daytime and evening entertainment programmes that keep guests entertained with varied activities such as themed nights, folkloric dancing and live music, making it great fun for all the family. Those who have come for the clubbing scene will not be disappointed as a host of nightclubs can be easily walked to from the apartments and keep you partying through the night. Visitors to this part of Ayia Napa can also cool and have fun at no fewer than three waterparks and history buffs will love the National History Museum of Ayia Napa.